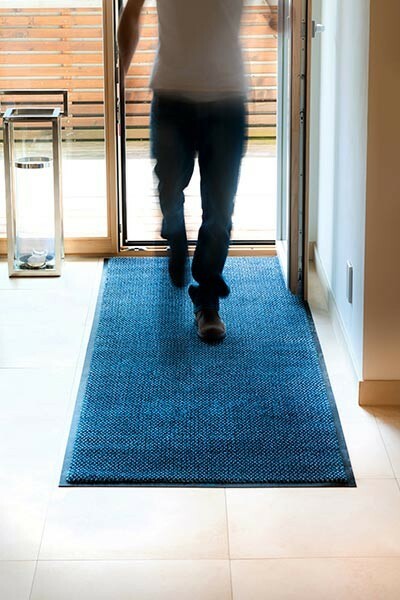 Loose Lay Floor Mat Placement is key to stopping dirt from outside entering a building. Roughly 40% of a buildings cleaning budget is spent on cleaning the floors and tracked in dirt accounts for 90% of the dirt in a building. The correct use and positioning loose lay floor mat placement will save money on cleaning cost and flooring replacement in the long run. Below are two images; one image demonstrates the wrong placement of a loose lay floor mat and the other image show a saturated mat full of dirt and the effect on the surrounding floor. 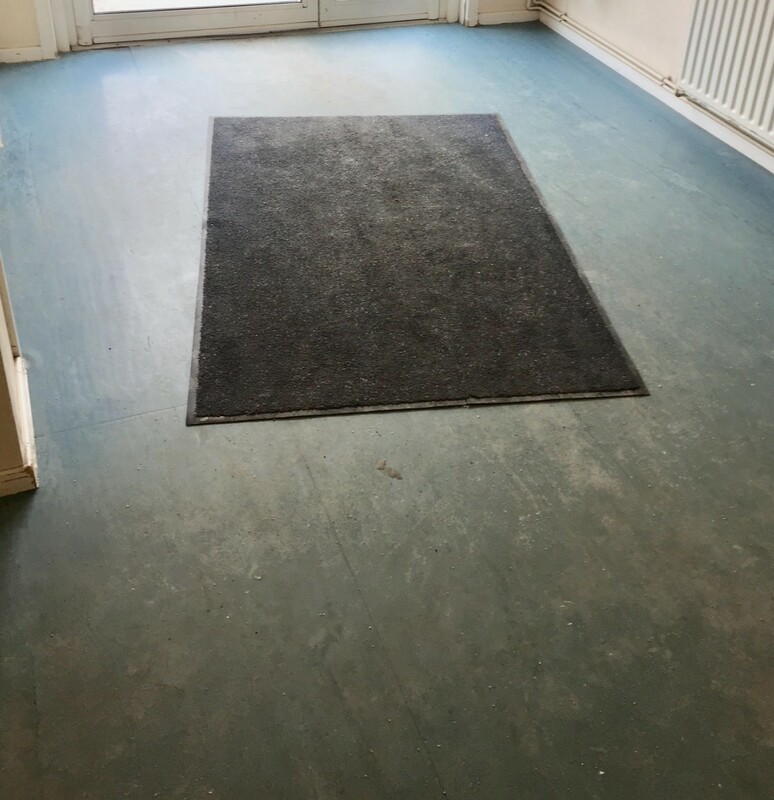 It is possible to improve the amount of dirt entering a building by using the correct loose lay floor mat placement and regular cleaning of mats and entrance matting. 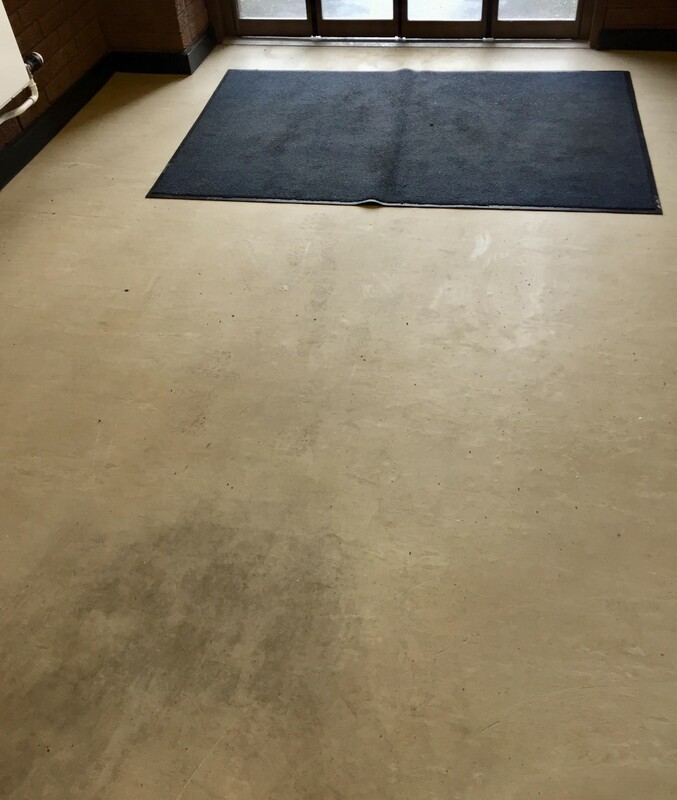 For example in a commercial building people do not wipe their feet, the dirt is removed by the action of walking across the mats or matting. Therefore it is import that the mats are place portrait and not landscape, this way you will achieve 3 to 4 footsteps on the mat as opposed to 1 or 2. Also sizes does matter, the bigger the mats or matting the more footsteps and the greater amount of dirt can be captured. Often fixed entrance matting is supplemented by loose lay floor mats simply because the correct number of steps to remove the dirt is not being achieved. Regularly cleaning the mats helps because without regular cleaning the mats become saturated and the dirt capture process will stop. For loose lay mats vacuuming once a day and then washing once, twice or 4 times per month depending on footfall will ensure greater dirt capture. Jane Coward, Managing Director at Ginger Mats says “in the short term whilst mat rental contracts and the use of larger loose lay floor mats seems expensive, in the long run they can save a company huge costs on the replacement of floors”.